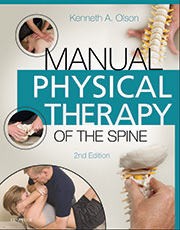 Over 200 video clips have been included on this website so that the vast majority of examination and manual therapy treatment procedures presented in the textbook, Manual Physical Therapy of the Spine, are now available via video. The video clips were filmed at Marquette University with the technical support of the Marquette University Instructional Media Center where multiple camera angles are used to assure excellent visualization of each procedure. Each technique is described as it is demonstrated to provide clear, step-by-step instructions in proper performance of each procedure. The video clips can be used by instructors to augment classroom instruction or by students as a useful reference to enhance learning. Copyright © 2015 by Elsevier. All rights reserved.